I have been itching to drive Irving again ever since we got him to the storage lot about a month ago. Yeah, I know, we bought an expensive motorhome and we haven’t driven it since we took delivery. We had Christopher’s birthday vacation to Animal Kingdom Lodge and Amber and Christopher spent time at the beach with friends in June. These things were planned long before we bought our coach, so there was no avoiding them. In a previous post, I mentioned that the bed in our coach was way too hard for us, so I ended up ordering a memory foam mattress with a foam base. It came yesterday, so we decided to take the RV for spin to get gas and then back home to install the new mattress. We didn’t need gas, I wanted the practice of getting gas before we had to do it. I noticed that the Sam’s Club near our house had very high clearance, so we decided to go there. I got very lucky pulling out of the storage lot, traffic lights going in both directions we red and I was easily able to cross to the other side of the road. Heading home from Sam’s Club meant that I would have to go into our residential neighborhood of narrow streets. I decided to take the long way around because the usual entrance to our neighborhood has a median that I would have never been able to turn into. These are things that need to be thought out ahead of time and I’m glad I did. We did encounter some tree branches that made that screeching sound as they ran down the side of the coach. I cringed. After getting Irving home and into the driveway, our across the street neighbor came over to see Irving. He’s been wanting to do what we are doing for a long time and all he could say is that we had a gorgeous coach. We got the mattress installed and headed back to the storage lot. I made the mistake of taking back roads in our neighborhood and it was pretty stressful. Our coach barely fit in the lane and Amber was very jumpy, making me anxious. We made it back to the storage lot unharmed and I had more driving experience under my belt. We all agreed that this will only get easier. I had picked up from various sources that running the coach generator was a good idea for at least an hour a month. Then I started reading the manual for our generator and discovered how important “exercising” an RV generator really is. When you don’t use an RV generator regularly, moisture builds up and the system starts to degrade. 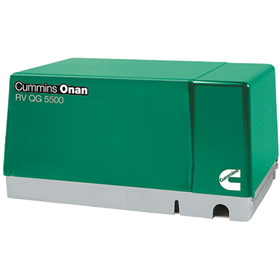 For our Cummings Onan 5500 gas generator, it is recommended that it be run at a minimum of 50% capacity for two hours every four weeks. It is best to run the generator for one long rather than several small periods of time. This keeps the internal parts lubricated, gets moisture our of the system, and prevents what’s called varnishing. We were worried that we would not be able to run the generator while at the storage lot, so Amber asked the management and they said it was ok. I have gone to the storage lot to check on Irving and while I was there the last two times, I ran the generator for over an hour each time with both air conditioning unit running. It was very necessary to run both A/C units since it was over 100 degrees in the coach when I arrived. We are definitely learning these things as we go along. It helps to learn as much as you can about your particular RV so you can keep it running for many years. It’s been a busy few weeks since we brought Irving home to the storage lot. We have visited him a few times, but with a vacation that was planned and Amber and Christopher going to spend time at the beach with friends, we have not camped since we took delivery. I have been looking at maps of the US to find campgrounds in places we want to go and have started making a list. It’s been frustrating for me not to be able to make a real trip yet. I know it’s coming, but I am anxious to get going on our adventure. We have already made a reservation for Disney’s Fort Wilderness Campground in late August. We will be doing a trip to the KOA about 5 miles from our house, most likely at the end of July. We wanted to go close by to get more practice with setting up and if we forgot anything, we can go home and add it to our list. We can also practice cooking, etc. Sometimes things take time, but they happen eventually.